I don’t want to let this blog go stale while I’m hard at work between releases, so I thought I’d explain a few background tidbits on stuff in my first two titles. It’s all trivia-level stuff, nothing I’d consider spoilers and nothing that’s too important in the final works, but perhaps interesting nonetheless. There are a lot of little details that have unusual origins or have changed in interesting ways. Sometimes those are fun to look at. Read ahead for some of this trivia, as well as a small update on my next work, The Prince’s Revenge. My main character, Thaddeus, is actually named after one of the Twelve Apostles, Judas Thaddaeus. I selected the name because I think of Thad as sort of a betrayer. He isn’t a betrayer of someone else, but a betrayer of himself, of his own ideals and morals. By the time of Rescue at Waverly, he’s become so obsessed with his search for Earth that he’s abandoned almost every moral value he’s ever held, and the entire purpose of that novel is to awaken him to that fact. But I didn’t want to outright call him Judas because that’s too obvious, so I chose Thaddeus instead, accidentally conflating Judas Thaddaeus with Judas Iscariot. Oops. Thaddeus also has the advantage of being a somewhat unusual and memorable name. Despite my “mistake,” it worked out well for a different symbolic reason. According to Wikipedia, the Roman Catholic Church views Judas Thaddaeus as the patron saint of desperate cases and lost causes. I actually did not know that when I chose the name, but it fits my character very well, especially given the thread of tragedy weaved into his story. As for his last name of Marcell, the truth is a bit silly. If you’re looking for symbolism here, too bad. For a long time he simply had no last name. At some point I decided I needed something and I just started looking around the room. I had a Marshall electric guitar amplifier sitting nearby, so I gave Thad the surname of “Marshall”. Later on, I corrupted the name into the similar word “Marcell” just for uniqueness’ sake. Rescue at Waverly mostly takes place aboard Thad’s personal flagship, a frigate called the Caracal. Long ago, I’d decided to name his Blue Fleet warships after predators. Originally, this ship was titled the Wolverine, after the vicious bear-like animal that is far more dangerous than its small size suggests. I thought it was the perfect metaphor, given how Thad and his fleet of small-but-effective warships operated. However, I took a very long time to draft and complete this novel. So long, in fact, that a whole bunch of X-Men movies were released during this time. Before then, I vaguely knew of Wolverine as a comic book superhero, but I never even considered the X-Men when naming this starship. And thanks to the movies, the word “wolverine” quickly lost its identity as anything apart from the X-Men. During final editing, I changed it so I wouldn’t distract my readers with unintended references to other franchises. I ended up studying lists of predators and stumbled into the caracal, sort of a funny-eared wildcat. It was an odd, memorable, and unique name, and all three of those are very important qualities when writing fiction. 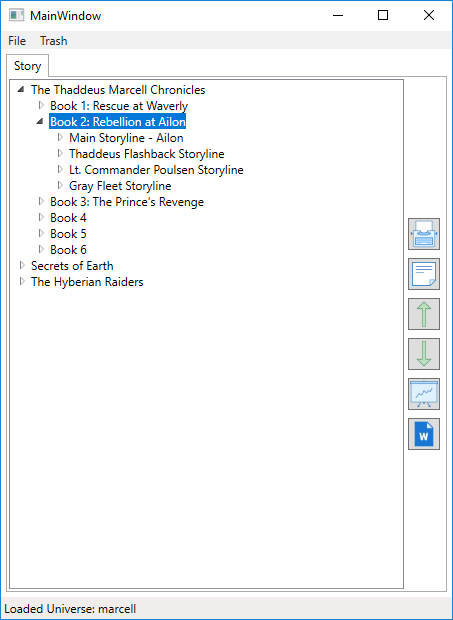 In Rebellion at Ailon, Thad operates under an alias, Chad Messier. This is because he was partially responsible for Ailon’s enslavement and he needed to remain anonymous while he was there. As an astronomy and physics nerd, I decided to call him Charles Messier, in honor of the famous French astronomer by that name. Later on, I changed his first name to Chad for the practical reason that it was very similar to Thad, making it easier for him to adjust to the alias. In Rebellion at Ailon, there’s a member of the Ailon Rebel Council named Culper who controls the rebels’ intelligence networks. This was a not-so-subtle reference to the Culper Ring, although you might not know this unless you’ve done some serious study on the American Revolution. As should be fairly obvious by Rebellion at Ailon, she’s now basically the second main character for this series. I use her point of view to provide insight into the more mercenary-like sections of Thad’s organization, since Thad himself is far more concerned with finding Earth than he is with personally fulfilling merc contracts. I used to play a lot of “Elite: Dangerous”. In fact, I was among the first thousand players to make the journey to the center of the galaxy and visit the supermassive black hole Sagittarius A*. That was a huge (and perhaps wasteful) time commitment, and I spent a lot of time studying the game’s fairly-plausible map of our Milky Way galaxy. One of the regions I had to cross on that journey is called the Norma Arm. While wrapping up my first novel, I still didn’t have the setting figured out so I tentatively chose this region (although the Norma Empire only gets a few minor mentions in the first book). It’s far enough from Earth to practically be a different universe, yet close enough that well-prepared starships might be able to make the journey–if they’re lucky and have an extremely-dedicated crew. But, truth be told, the story’s exact location in the galaxy is still an unresolved issue, so don’t take this section as definitive proof of anything regarding Earth’s location in my fiction. The Norma Arm’s distance from Earth (around 12,000 light-years at the closest) is probably a bit too far for the starships available in my world, even considering a few extenuating details that are Top Secret™ for now. But the location and distances are not really relevant until Book 6, so I have plenty of time to make a decision. In the end, the name might simply end up being a coincidence. Finally, I wanted to give a brief update on Book 3’s status. One of the great things about being self-published is that I can do things at my own pace. No external deadlines or pressure from publishing companies. Sometimes things really drag out, but sometimes they go faster than expected. So, assuming I can keep the pace up and don’t need to do any major rewrites, it’s quite possible I’ll release this one well before the end of 2019. I’d love to step up to two releases per year, because I have quite a backlog of ideas I’d like to work on! I’m doing some planning and mapping while I detail out some parts for my upcoming third novel, The Prince’s Revenge, and part of that involves adding some areas to my map of the “galaxy”. 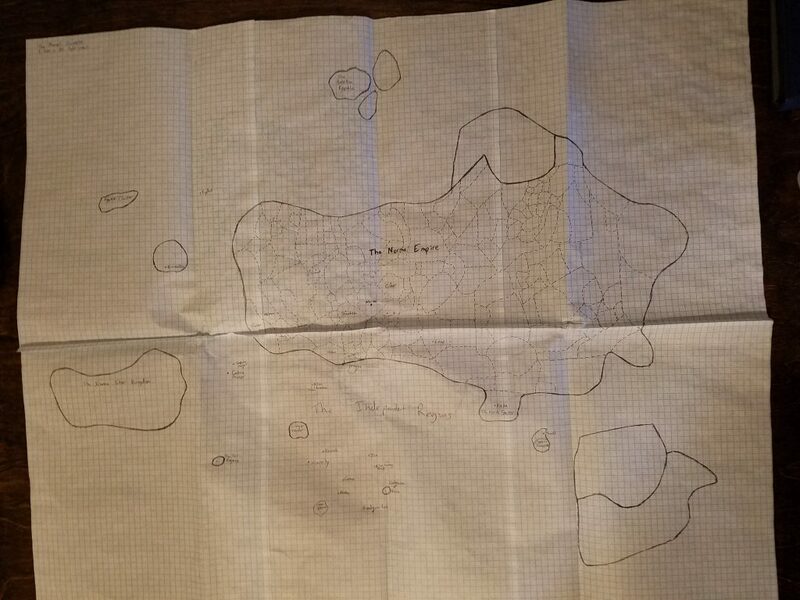 I decided to share a terrible cell phone picture of the map and go over a couple points, just for fun. I used to work in Geographic Information Systems (GIS) and even though that was years ago, I’m still a map nerd. A map of the Marcellian Universe (click to enlarge). Each grid cell represents 25 light-years. So far, the majority of my work has taken place in the so-called Independent Regions. This is a large, lowly-populated area that’s all galactic “south” of the Norma Empire. Lots of tiny governments, single-star-system civilizations, and tons and tons of empty space. Plus Thad’s Headquarters asteroid. If you’ve paid close attention, you’ve seen the Norma Empire mentioned multiple times in my work, but mostly as a background element that doesn’t seem too important. That will change as the series progresses. Basically, the Norma Empire is a huge confederation of Imperial States, each one led by a Duke who’s mostly an absolute monarch in his state but has pledged fealty to the Emperor at Norma in return for protection and stability and economic advantages. I mostly modeled it after the Holy Roman Empire, the medieval predecessor to Germany which, as the joke says, was neither Holy, Roman, nor an Empire. But the important fact is that Norma is the oldest, most highly-populated, most important, and most powerful civilization in my universe, and it occupies a huge chunk of the area of the “galaxy” civilized by mankind. I put galaxy in quotes because it’s kind of an overused term in science fiction, and it’s also not really that accurate in my work. Our Milky Way galaxy, in which my fiction takes place, is a disc-shaped region anywhere from 90,000 to 150,000 light-years in diameter depending on who you ask. But the region of civilizated space in my work (okay, I have no idea how I typo’d civilized into that, but I’m leaving it in because it made me laugh…) is at best less than 3,000 light-years wide, which means that mankind has visited very little of it. If the galaxy was the size of the Earth, then the characters and empires in my stories have barely left their house yet, and certainly haven’t crossed a street. And yet it’s still a huge volume of space that can take months to cross in hyperspace. Today, I’m officially releasing my newest novel “Rebellion at Ailon” through Amazon.com! 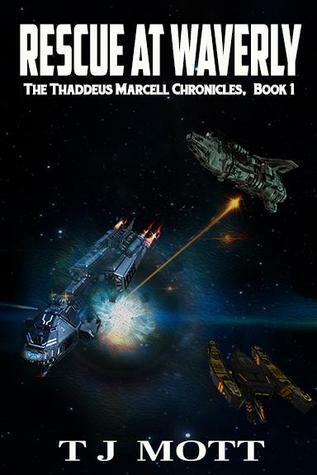 This is the second book of the Thaddeus Marcell Chronicles, and it follows Thad as he attempts to take a sabbatical from his mercenary organization yet ends up in a war anyway! You’ll also get a look at some other parts of his Organization, including the formation of a brand-new Blue Fleet squadron and the efforts of a pair of Gray Fleet spies in Imperial space. It all comes together in an epic battle for freedom at a world called Ailon! Since releasing “Rescue at Waverly,” I’ve been submitting links to my work all over the Internet, to various promotional sites to get my name out there. And one of the things I constantly get asked by the online submission forms is some variation of “What inspired you to write?” I thought it might be fun to go into further detail and examine the history of my project, “The Thaddeus Marcell Chronicles.” And if you’ve ever considered writing your own fiction, maybe if you see how my process went, it’ll give you some ideas. When I was a kid, most of the fiction I read was from the Star Wars Expanded Universe, which was a collection of novels that were first released in the early 1990’s. I loved reading, and starting around the third grade, I spent much of my time in school ignoring my teachers and quietly reading Star Wars novels instead. At some point, for whatever reason, I decided I wanted to write science fiction, too. Why? I don’t know, it’s been so long I don’t remember. Maybe it’s the same nature that made me want to get into programming after spending so much time with computers as a kid, because I was exposed to Microsoft QBasic at around this same time. But that desire to write never really went away. As I grew older, it was fueled by my interests in math and physics, and it persisted even when I found myself working a full-time career in IT and software development. Around the same time, plus or minus a year, I remember working on a story involving a toy robot. It was given to some kid as a Christmas gift. However, it was accidentally programmed at the factory to be a military assassin, and once turned on, it escapes from its family and starts a robot revolution. I was young and impressionable, and I’m pretty sure I had just read “Tales of the Bounty Hunters” and regurgitated IG-88’s story in my own terms. Minus the parts where he uploaded a copy of his droid brain into the second Death Star’s main computer, of course. In sixth grade, I had my first “finished” work. We were supposed to write a short story for a school writing project. I wrote about a cadet in flight school who passed a flight test by using a highly-classified starfighter maneuver that he wasn’t supposed to know about, and so he got in a lot of trouble for it. But he was friends with the guy who’d developed it, who was a high-ranking wing commander or something. Most of the story was about the flight itself. (If I had to guess, I must have been reading the “X-Wing” series at the time.) I remember my teacher saying that it was very unique coming from someone my age. Sadly, I don’t have a copy of this anywhere, because I think it would be funny to re-read something I’d written at the end of elementary school. This story started in seventh or eighth grade, I believe, around 2001. I was in a typing class in school, but I somehow already knew how to type well. (Hey, I was born in the late 1980’s with a keyboard in one hand and an MS-DOS command reference in the other. I learned to type at such a young age that I don’t even remember it.) So instead of following my typing lessons, I mostly goofed off. At the time, the school had a computer lab full of Am5x86’s loaded with Windows 95 and something like 8 MB of RAM. And you didn’t dare go out to the Internet on them. Have you ever seen a 486-class PC try to load web pages with animated Flash advertisements and ten pop-ups per second? It wasn’t pretty. So when I wasn’t modifying minesweeper.ini files to give myself an impossible high score on every computer in the lab, I mostly goofed off by writing, because Word 95 ran fairly well once it actually finished loading. During this class, I ended up writing a partial story about the three co-equal Presidents (a triumvirate) of Alpha Centauri, which was a former colony of nearby Earth. The main character was one of the Presidents, and he was also a General in charge of the military. Everything was perfect in Alpha Centauri and so the characters spent their free time building giant lasers and blowing up asteroids, or moving moons into different orbits with huge rocket motors just for fun, and things like that. In hindsight, it was pretty silly stuff. I didn’t have any goals, and the story was nothing more than a disjointed string of juvenile sci fi dreams written just to kill some class time. Then the story was going to switch to a flashback. After his abduction, the original non-robot General discovered there was a huge human civilization out there, with hyperdrive and all kinds of advanced technology that Earth and Alpha Centauri never knew existed. He became a pirate and a mercenary, scouring the galaxy to find his way home. Along the way, he stockpiled weapons and technology to bring back so he could defend his home from the rest of the galaxy, and he became the leader of very powerful independent fleet. This returning General (he was named Thomas back then) was grizzled and battle-hardened, covered in scars and even with a cybernetic hand. After the flashback ended, it would return to the present. Earth and Alpha Centauri were near the edges of a rapidly-expanding empire which they certainly couldn’t fight, not without help. Then there would be a massive interstellar war, and all the ships and weapons and technology that the General brought home would save the day. 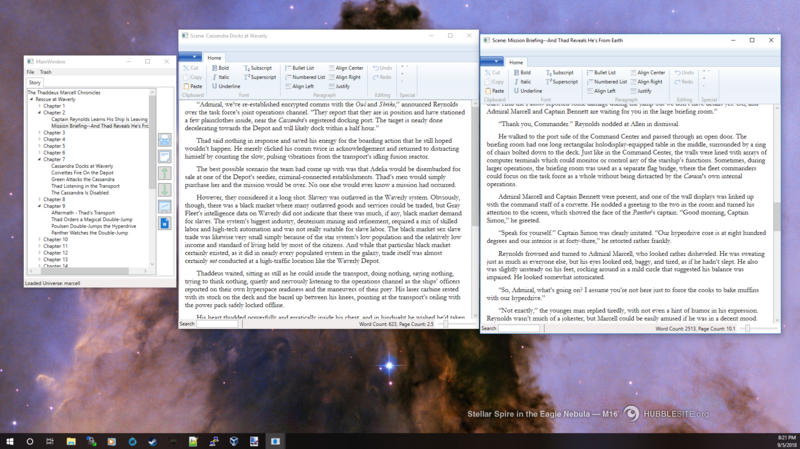 Writing a Novel – For Real This Time! My ideas got shelved for a long time, but I never forgot them. I still had the itch to write, but I never felt inspired enough to make a serious effort on anything. Finally, I had a dream which inspired my first published novel. It was short, just a tiny snippet I remembered after everything else faded, but it ultimately became a scene in “Rescue at Waverly” and was the seed that sort of defined the whole work for me. In this dream, a man is aboard a small transport, trying to reassure a woman he’d just rescued from an enemy starship. She was someone he once knew and loved, but somehow they’d been separated by life’s circumstances and he hadn’t seen her in many years. For some reason this really struck me. But it wasn’t a story. It was just a snapshot, an image without any context. So I provided the context by dusting off some of my old backstory about the General from Alpha Centauri. I threw away the juvenile silliness about moon-sized rocket engines and blowing up asteroids for birthday celebrations. I also got rid of details that seemed cool when I was in junior high school, but really didn’t make sense to me anymore. Why was he replaced with a robot, and by whom? And how did nobody ever discover that a President was a robot? I couldn’t come up with any reasonable explanations so I changed him from a President and General from Alpha Centauri into a complete nobody from Earth, with no robot clone to replace him after he disappeared. Even then, as some details began to take form, I wasn’t sure how to begin. Writing a novel with the intent to publish it is a big undertaking, and I never had any formal education in anything like this. I have a somewhat intuitive sense for writing and grammar just because of the sheer amount of reading I’ve done in life, but I never paid much attention during my English or writing classes in school. So during my 20’s, I probably wrote 20 different versions of the first chapter. Each time I finished it, I hated it, so I’d throw it away and start a new version from scratch, with different ideas and characters and starting points in mind. During one of these, I decided to begin the storyline well into his pirate/mercenary career, rather than starting at home before he was abducted. And that actually made things a lot easier. Although I was frustrated by my lack of progress, looking back now, I realize how important it actually was. Writing takes practice. You can’t start cold and inexperienced and put out a well-written work on your first try. All of those thrown-away chapters were bad for various reasons, but with each iteration, it got better. My skills as a writer improved, the work slowly became more plausible and less goofy, and it also became more focused. After years and years of these false starts, I finally had something workable by around 2015. During 2016, I decided to take it seriously. I began putting some serious time and effort into it, and had a pretty rough early version of “Rescue at Waverly” written by the beginning of 2017, although later that year I literally deleted the entire middle section and re-wrote it all from scratch because it was terrible. But 2017 was a very big year for me. I finished the first novel, wrote about a third of its first sequel, and plotted my ideas out into a six-book series. I finally self-published that first book at the start of 2018, and although the details have changed dramatically, it still has minor traces of my old fifth-through-eighth-grade science fiction fantasies in it, if you know exactly what to look for. While working on “Rescue at Waverly”, I had another inspiration from nowhere which lead to “Rebellion at Ailon.” It was just a daydream, really, I don’t even recall when or where or why. And surprisingly, the daydream didn’t even make it into the final book! I wrote a few variations on it but they just didn’t work, and I eventually decided that it was a bad idea and abandoned it. But the story I developed around it seemed to work, and so I actually finished writing that story without the very seed that had spawned it! I guess I’ll say this much: it centered around Thad, who’s been operating under an alias, revealing his true identity to a certain Ailonian. I can’t say any more because it would reveal some spoilers even though the event never happened. But it’s a quirky thing that surprised me when it happened. The entire novel was written to develop and support a single scene that didn’t make it into the novel! As I worked on “Rebellion at Ailon”, I continued to develop the rest of the series. I have pages and pages of notes and character biographies and even one large hand-drawn map of space, and as I added detail to this mental model of my science fiction universe, the storyline began to take on a life of its own. I’ve changed or even removed certain plots or storylines, ones I’d planned long ago, because they’re no longer consistent with the direction things have gone. It’s like I created a living, breathing thing, and now I’ve lost control of it. And yet things are advancing in a manner that, to me, seems quite logical and natural given the background of history, politics, and technology that I’ve already developed. The important thing is that the series still ends exactly where I wanted it to. It still hits many of the important waypoints I created in order to get from start to end, but it otherwise deviates greatly from the course I’d originally plotted. And I think it’ll be a far better work because of that, because some of my earlier ideas were terrible. Some of them just followed basic science fiction tropes, abandoning the strong character development and realistic environment I strived for in “Rescue at Waverly”. Although they still got from Point A to Point B, sometimes they really became campy, relying on stupid tech gimmicks and forgetting that I’m trying to develop characters who will have changed a lot by the time the series concludes. So this was kind of long and meandering, but I hope it was interesting. One important take-away is that the ideas I’m publishing now didn’t just happen in recent history, and many of the ideas weren’t even consciously developed. No, it’s all been simmering in the back of my mind for a very long time, around 20 years! I can’t speak for other writers, but for me it simply took that long to get all my ideas in order, and for me to mature enough to do something with them. Is that normal for writers? I don’t know. Maybe if I’d paid more attention in class instead of reading Star Wars novels, I’d know more. Then again, if I’d paid attention in class instead of reading Star Wars novels, maybe I never would have started this project. The ebook edition of “Rebellion at Ailon” is now available for preorder at Amazon! In this sequel to “Rescue at Waverly,” Thad takes a sabbatical from his mercenary organization to heal from his wounds and re-evaluate his life. He travels to a world called Ailon, which once lost a war because of his own actions as a pirate. Once there, he assumes a false name and volunteers for a medical clinic that provides care for the enslaved population. However, he soon finds himself caught up in a new insurrection, one that badly needs experienced soldiers and leaders. Can he, one of the most hated men in Ailon’s history, help Ailon fight for its freedom while keeping his identity secret? Head over to Amazon and pre-order the $2.99 Kindle edition now. It will be released January 1, 2019. It’s enrolled in Kindle Unlimited, so if you subscribe to KU, you’ll be able to read it for free! I’m currently formatting the paperback edition. Depending on how long it takes me to deal with proof copies and fix any formatting issues, it should tentatively be available sometime during January 2019. This novel is much longer than Rescue at Waverly, and as a result this paperback will be a bit more expensive than expected. Sorry, paperback fans, but self-publishing is a tricky business! The Thaddeus Marcell Chronicles will be a six-novel series, and as I wrap up Rebellion, I’m already shifting my efforts into Book 3, titled “The Prince’s Revenge.” In this novel, war breaks out in the Independent Regions as an old enemy of Thad’s–whom you probably remember from “Rescue at Waverly”–tears the galaxy apart to find him. I like to work ahead. I have lots of key chapters for the entire series already written, and as I flesh out Revenge, I’ll continue to develop the final three books. I can’t say too much about them this early on, but I will say that very big things happen! Stay tuned, and thanks for reading! Starting today, I’m running a one-week discount for Rescue at Waverly over at Amazon.com and Amazon.co.uk. This will run until Monday, November 5, so if you want to get it at a reduced price make sure to do so now! As always, if you are a Kindle Unlimited subscriber you can already read this novel for free! 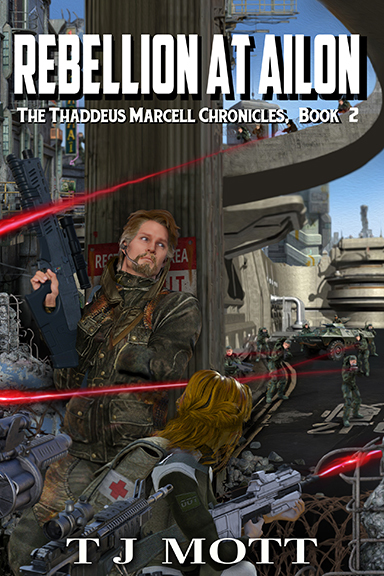 First off, I assure you all that Book 2 of the Thaddeus Marcell chronicles is mostly written now. I’m nearly done with my first draft of “Rebellion at Ailon” and then comes the editing process. I feel much more experienced and confident this time around, and so I think that this first draft will be pretty close to the final published version, apart from some polishing, fixing up consistency issues, replacing some placeholder names with real character names, spending some serious time with a thesaurus, and so on. In any case, I’m feeling very comfortable with my self-imposed publishing deadline of January 2019. But none of that is really the topic today. Instead, I want to talk about far more interesting things: word processors. Are you nuts? Why In The World Would You Write Your Own Word Processor?!?! 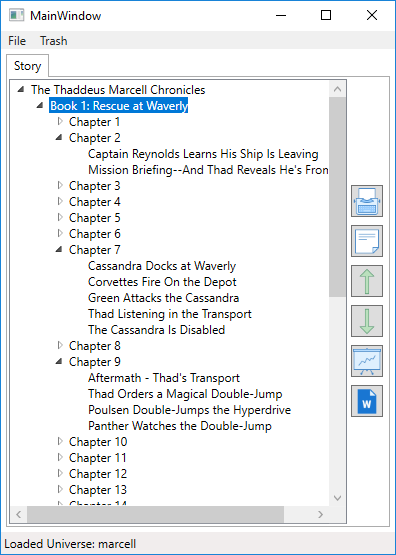 When I started writing the Thaddeus Marcell Chronicles (probably around 2016-ish is when I got serious about the project, though it’s been on my radar since junior high school and I’ve probably had half a dozen aborted attempts since then) I switched back and forth between Microsoft Word and LibreOffice, depending on whether I was on a Windows or a Linux PC. Towards the end of 2017, I ran into some major annoyances while editing Rescue at Waverly. My biggest problem was how much I needed to move things around. Scenes and chapters got cut and pasted all over the place while smoothing out the story flow. But the document was difficult to navigate. Word and LibreOffice outlined inconsistently and didn’t always get along, and I found myself doing document-wide searches on a few remembered phrases just to get me close to the section I was trying to find. But I’m a software engineer, right? I don’t have to put up with this! I’m gonna go make my own word processor! With blackjack and hookers! My main goal was to improve document organization so I could easily navigate it and move things around. Overall, it’s really basic and tailored specifically to my use. Sometimes it’s buggy, and it’s definitely not at all fit for public consumption. It saves everything to an XML document and I still sometimes have to hand-edit the XML to do a few things because sometimes that’s faster than adding the feature to the application itself. It’s written in C#, using WPF (Windows Presentation Foundation) for the user interface and targeting .NET Framework 4.5.something-or-other. Unfortunately, using WPF means it will not run on Linux even with Mono or Wine, but oh well. 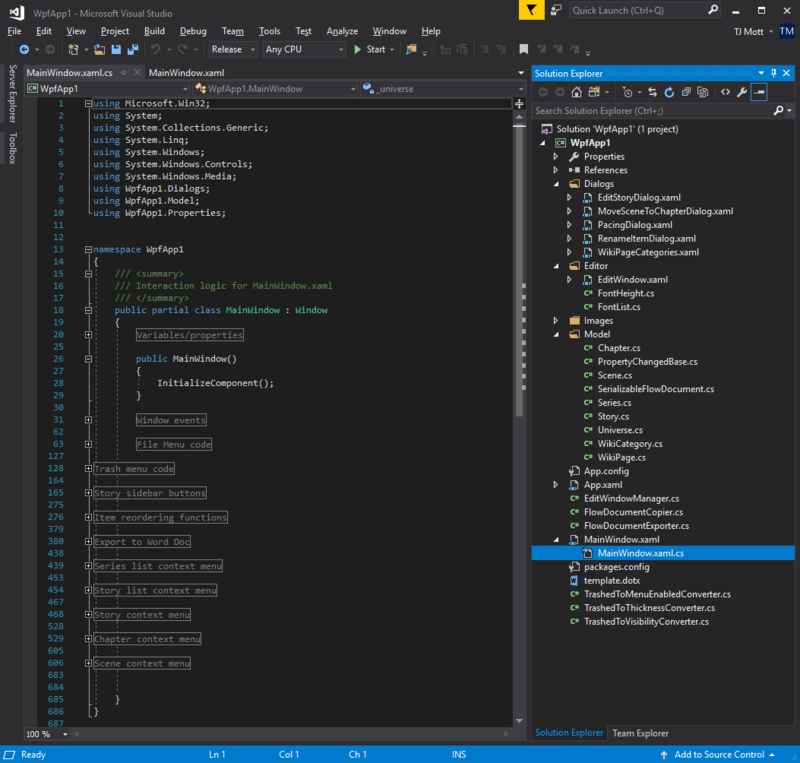 C# is my best programming language and I had to compromise somewhere in the interest of developing something quickly. In this case I lost the ability to write on over half of my personal PC’s. Universe: A Universe is a single XML file containing a collection of related stories. Series: This is what you’d expect. A series is a collection of related books, usually with a common theme, characters, and plotline. As you can see above, I have plans for three series in the Thaddeus Marcell universe. Chapter: Okay, I need to quit starting definitions this way, but this is what you’d expect. Here, a chapter is a collection of Scenes. Chapters are somewhat arbitrary. I’m sure there are rules out there somewhere, but I don’t know the rules and I don’t play by the rules. Scene: A scene is a single narrative section. In my writing, a change of scene usually involves a change in point of view or narrator, or a skip in time. You can see some scenes listed under the chapters above. Scene names are only for me, they are never included in the published work so sometimes I get pretty goofy with them just so I can remember it. Trash: You don’t delete stuff, at least not intentionally. If I delete something, it only gets hidden and moved into the Trash. It takes a conscious effort to “Show Trash” and then delete stuff later. I just clicked on “Show Trash” for this screenshot, and I couldn’t tell you what half the deleted things were supposed to be. Many of them are empty scenes. I guess I need to empty the trash sometime. Showing the Trash. Okay, I admit I deleted the USPSA scene because my fellow IDPA Safety Officers would have my head about it. I quickly learned how to abuse chapters. Now, when setting up an outline I create a “chapter” for each subplot, and fill it with scenes. Later, during the editing process, I move the scenes out and interleave them into the real chapters that end up in the published version, and the subplot chapters get trashed. I also have the ability to color the scene names in the main window. You can get a glimpse of that in the trash screenshot above, where some entries have red text and others are black. This is arbitrary. I use it to flag sections I know are done, or mark ones that really need some more work, or to mark scenes for possible deletion. 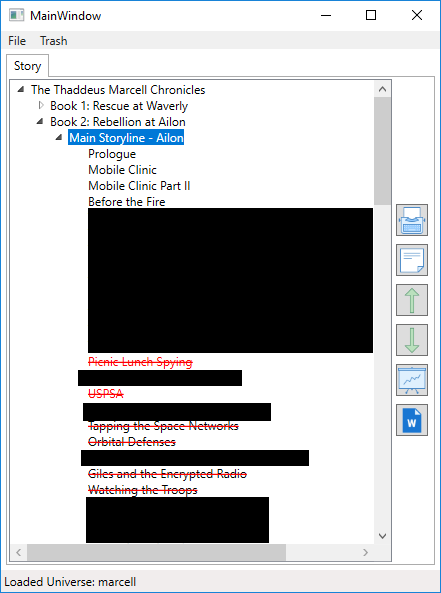 Abusing chapters to organize subplots – with bonus not-quite-spoilers on Rebellion! Here’s a screenshot of the main editor that opens when I edit a scene. Each window only shows one scene at a time, but I can have several such windows open simultaneously when I need compare different scenes/chapters. I don’t think Word or LibreOffice really know how to do that. Okay, so I didn’t really write a word processor. Not like you’re probably thinking, if you aren’t a coder and you’ve somehow survived reading this far. Actually, most of the main editor window is just an out-of-the-box System.Windows.Controls.RichTextBox instance, which gave me just about everything I needed for a basic word processor without writing much code. Thanks, Microsoft! I simply dropped in a RichTextBox, hooked up some editing buttons (most of which I’ve never actually used or even tested, and I’m sure some of them will BSOD all PC’s within half a mile of me if I actually click on them), and a few extras like the bug-ridden-but-I-don’t-care zoom control and some basic document statistics. Despite its importance, this really is the smallest part of the application. I spent at most an hour putting this editor window together, and the vast majority of that time was spent coding the search feature that I’ve only used maybe three times ever. Overall, this editor probably has 2% of the features of Word or LibreOffice, but it’s the 2% I care about so it works well for me. To me, the real value is in the rest of the application, not in the editor itself. 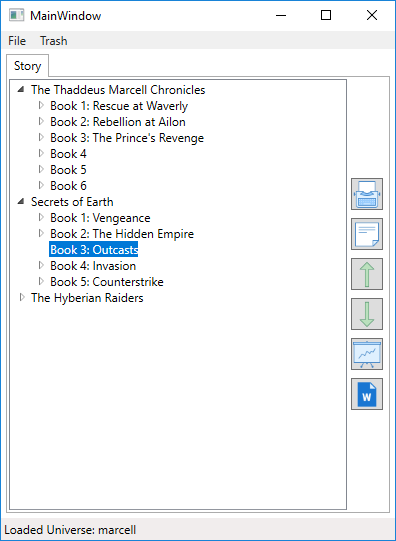 I spent most of my time elsewhere developing seemingly-trivial things like reordering scenes, renaming chapters, collecting statistics, and exporting portions to Word format using a template that’s close-ish to what I need to upload to the Kindle Direct Publishing website. And context-menu handlers! So many context-menu handlers! Most of the application’s C# code (incorrectly) lives inside event handlers in MainWindow.xaml.cs. There are some 600-lines of context-menu and button handling here! You’ve seen most of the application already. Most of what’s left is pretty boring, but I’m a bit proud of these two parts. Statistics Dialog example, apparently for Chapter 7. Here, I can see statistics on a selection. This can be for a single scene, a chapter, or an entire story. I realize this looks very boring and mundane at first, but Word/LibreOffice only gives you document-wide statistics. It wasn’t easy for me to figure out how long chapters or scenes were. Now, it’s trivial. It also works great with how I organize things while drafting. 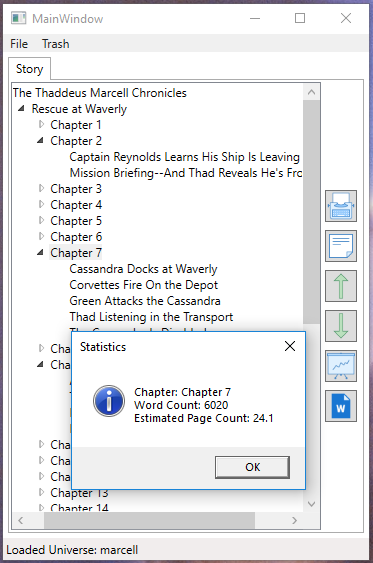 Since I (mis)use chapters to organize subplots during the initial writing phase, I can view statistics on the “Crew Mutiny” subplot and see how long it is. Then I can decide if I need to add to it, or trim it down because it’s taking up too much of the story. This window breaks up a selection and helps you compare lengths. There’s a thick black border around each chapter (in this case, each “chapter” is a subplot for Rebellion). Within that is a colorful box for each scene. And all the boxes are proportionally scaled, e.g. a box that is twice as big contains twice as many words. It’s far from perfect. The scaling means the text on smaller sections is cut off and can’t be seen. Oh well. So, there’s a sneak peak into the mind of a software engineer who can’t even do non-software side projects without ending up writing software anyway. Maybe someday I’ll clean this up and release it under an MIT or BSD license. But no promises. Are you a Goodreads.com user? If so, head over there and enter my Goodreads Book Giveaway for a chance to win one of 100 free copies of the ebook edition of “Rescue at Waverly.” This giveaway runs for the month of September! If you want to preview the book first, visit its Amazon.com page here. The ebook is available in Kindle Unlimited, so if you’re a Kindle Unlimited subscriber you can already read for free! Giveaway ends October 01, 2018. Rescue at Waverly sale – $0.99! This week, I am discounting the ebook edition of my novel “Rescue at Waverly” on Amazon.com. $0.99 for the U.S. market and £0.99 for the U.K. market. The promotional price expires Saturday, July 28th at midnight (PDT). The ebook format has also been updated to include a preview from the upcoming sequel, titled “Rebellion at Ailon,” which I hope to publish early in 2019. Rescue at Waverly is my first published novel, released to Amazon.com in e-book format on January 1, 2018. 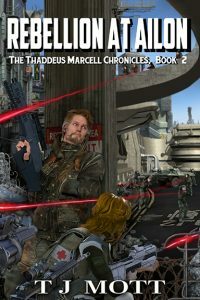 It’s the first story in a planned arc of six novels, introducing you to mercenary leader Thaddeus Marcell and his Organization, their place in the galaxy, and his quest to return to Earth. As his intelligence chief left the hangar, Thaddeus reactivated the computer in the table’s surface and skimmed through the reports downloaded from the transport’s computers, hoping it would be boring enough to finally help him sleep. He picked a folder at random and started scrolling through some of the travel schedules for the Waverly Depot, a space station and refueling center located just outside the Waverly system, about 350 light-years from Headquarters. As he reviewed a few records, he found himself looking at the manifest of a starship called the Cassandra. It was a converted cruiser which spent most of its time hauling freight of questionable content. According to the manifest Cooper had acquired from Waverly Depot’s confidential files, it had quite a haul of slaves and was on its way to the Depot for a refueling stop. He thought he saw something familiar and stopped to go back a few entries in the list. He frowned and felt his whole body tense up. His jaw dropped agape at what he saw, and he tapped the entry to bring it from the table’s surface into a larger projection above it. A name and a face hovered above the table, seemingly staring back at him. A name and a face listed as cargo. A name and a face he recognized…from home.